SAMBALPUR: Even as low pressure-induced rain has brought some respite from sultry weather, it has failed to cheer up the farmers in Sambalpur district, particularly those in rain-fed areas. Farmers who have gone for transplantation, are awaiting more rains that would allow them to prepare the bed for transplantation. In Kuchinda sub-division, comprising blocks of Kuchinda, Jamankira and Bamra, germination drought seems imminent in rain-fed areas where farmers have sown seeds. Though there was intermittent rain today, it brought little cheer for the farmers. Normally the sub-division receives about 1,500 mm rain annually while it is 464.5 mm in July. Despite drought condition last year till July 20, Kuchinda had received 306.8 mm, Jamankira 333.5 mm while Bamra had 391.6 mm of rain. But this year till July 20, Kuchinda, Jamankira and Bamra received 68 mm, 96.1 mm and 79 mm of rain respectively. This insufficient rainfall coupled with attack of swarming caterpillars has added to the woes of farmers. Although District Agriculture Officer Harmohan Patra said rains would help improve the situation, the ground realities present a grim scenario. THE HIRAKUD Dam (HD) in Orissa has the unique distinction of being the longest dam on earth. Built across the river Mahanadi, about 15 km upstream of Sambalpur, HD is the first post independence multi-purpose river valley project in India. It is intended for flood control irrigation and power generation. The foundation stone of the dam was laid by Sir Howthrone Lewis on March 15, 1946 and on January 13, 1957, Jawaharlal Nehru inaugurated the dam calling it the temple of modern India. The project provides water for 1,55,635 hectares of Kharif and 1,08,385 hectares of Rabi irrigation of undivided Sambalpur, Bolangir and parts of Kalahandi districts. The water released through the power house further irrigates 4,36,000 hectares of the Mahanadi delta. The dam’s installed capacity of power generation is 307.4 mw through its two power houses. The project provides flood protection to 9,500 sq km of delta area in the districts of Cuttack and Puri. At the time of its construction, the project involved submergence of 240 villages with fertile agricultural land of about 42,000 hectares. The land-owing peasants were paid compensation in cash, which varied from Rs 50 to 200 per acre. Around 22,000 families were displaced by the project and their displacement and rehabilitation has been a major issue in Orissa politics since the 1950s. About 1.5 lakh people were affected by the Hirakud project. In the original estimate, an amount of Rs 12 crores was provided for payment of compensation to the affected people. After revision, the amount was reduced to Rs 9.5 crores and the total compensation paid to the people was, in reality, only Rs 3.32 crores. A large number of families were evacuated from their hearth and homes without compensation from 1956 onwards. At the moment, more than 6,000 families are yet to receive their compensation and due to faulty and inefficient recording of personal details, they have lost all hopes and have exhausted all efforts in the last 50 years. More than 10,000 people, on March 30, 2007, in Bhubaneswar, organised a rally, under the banner of Hirakud Budi Anchal Sangram Samiti, rising slogans against the government for its continuous apathy and indifference to the ousters of Hirakud Dam. The Hirakhand Nagarik Parishad (HKNP), an elite organisation of Sambalpur town, made a representation to the President of India complaining against the supply of water to the industries. They also alleged that the dry part of the reservoir is being encroached upon by some industrialists, who have raised concrete cement structures. On October 26, 2006, the locals and farmers formed a 20 km long human chain, from one end of the dam to the other, to voice their protest against the decision of the state government. The people’s discontent has found expression through numerous rallies, protest marches and public discussion and meetings. 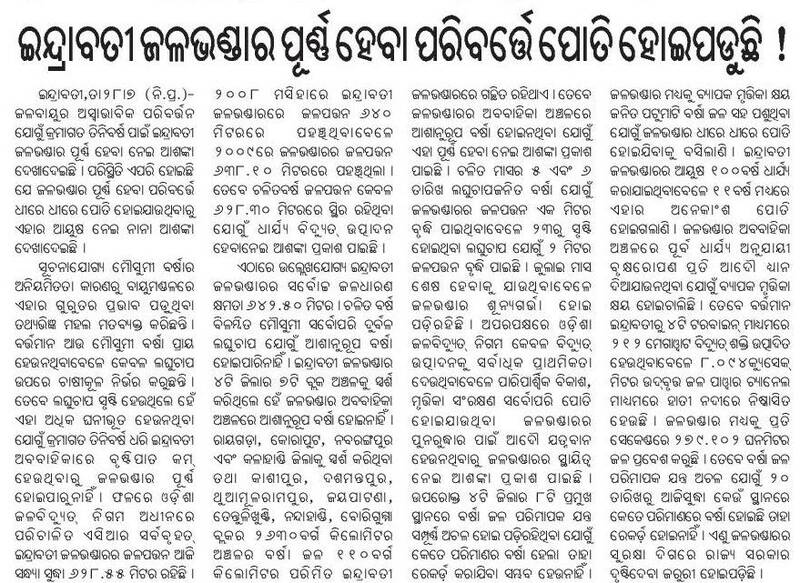 The voice of protest hardly reaches the government seated in Bhubaneswar. Supply of water was seriously criticised at the national level conference of the Bharatiya Kisan Sangh, held at Delhi. It was pointed out that more than two lakh farmers, directly, and 50,000 farmers, indirectly, would lose their livelihood because of the government’s decision to supply water to industrial houses.